Huhsien County in China's Shensi Province is not only outstanding in learning from Tachai in agriculture but is also stepping out ahead in fine arts. The Great Proletarian Cultural Revolution and the deepening struggle of criticizing Lin Piao and Confucius, especially, have brought great changes to the area. With mounting enthusiasm and revolutionary drive the peasants of Huhsien County are wielding paintbrush and palette to occupy the ideological and cultural field in the countryside and have become masters of the socialist new culture. A group of poor and lower-middle peasant artists, painting as a spare-time activity, adhere to the orientation pointed out in Chairman Mao's "Talks at the Yenan Forum on Literature and Art" and are training and maturing in the storm of two-line and class struggle. 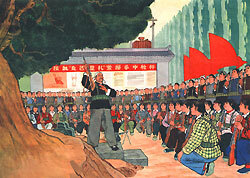 They are continuing with firm steps their march forward along Chairman Mao's revolutionary line in literature and art. The works of these peasant painters are militant and have broad mass appeal. All the artists are people's commune members -- women, youngsters and old people, Party secretaries, production team leaders, militia company commanders and accountants. They are all pathbreakers in production and at the same time an advance force in culture. With hoe in one hand and brush in the other and taking the Party's basic line as their guide to action, they are active in the three great revolutionary movements of class struggle, the struggle for production and scientific experiment and in carrying out the central task at each step of the revolution. 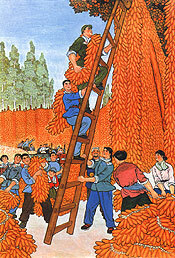 They have produced tens of thousands of paintings reflecting these struggles, warmly acclaiming Chairman Mao's proletarian revolutionary line, the socialist new countryside and the resounding victory of the Great Proletarian Cultural Revolution, while condemning revisionism and the bourgeoisie. They use revolutionary art "for uniting and educating the people and for attacking and destroying the enemy" [their emphasis] and have helped to develop the socialist economic base and consolidate the proletarian dictatorship. The Huhsien County peasant artists persist in painting on a spare-time basis so as never to be separated from the three great revolutionary struggles. They have correctly handled the relationship between politics and art and between the superstructure and the economic base and put into practice the principle of art serving the workers, peasants and soldiers, serving socialism and proletarian politics. They have set a pattern for developing fine arts as a spare-time activity in rural areas and become a model for professional artists. The broad masses of poor and lower-middle peasants grasping the artist's brush and wielding power in the cultural as well as in the political field is a deep-going revolution in the superstructure. It shows that the working people are not only the creators of man's social material wealth but are also the creators of man's intellectual wealth, that the working people are indeed the masters of history. This fact powerfully refutes the reactionary fallacies of Lin Piao and Confucius who trumpeted the idealist theory and "innate genius" and "the highest are the wise and the lowest are the stupid." It is also an antidote to the symptoms and influence of the revisionist line in contemporary art. The album presents a selection from paintings exhibited in Peking in 1973 with the addition of several more recent works.